Every week there is more failure. But those who seek only to avoid failure will never succeed at anything new. If you want to succeed every time at making something, go down to the Build-a-Bear shop in the mall, buy a Paint-by-Numbers kit, or cook a microwave TV dinner. Expect things to be done for you and that everything will just work without you having to do anything interesting. And then go read Seth Stevenson's article I tried a 3D printer and all I got was plastic goo in Slate. It is difficult for me to express strongly enough how disappointed I was in Stevenson's article while still remaining nice. When you buy a tennis racket or a chessboard, are you surprised when you aren't automatically a great tennis player or clever at chess? Does buying a new stove make you a good cook? Of course not, and using a 3D printer is no easy ride, either. The reason this article upsets me isn't because it is negative about 3D printing. 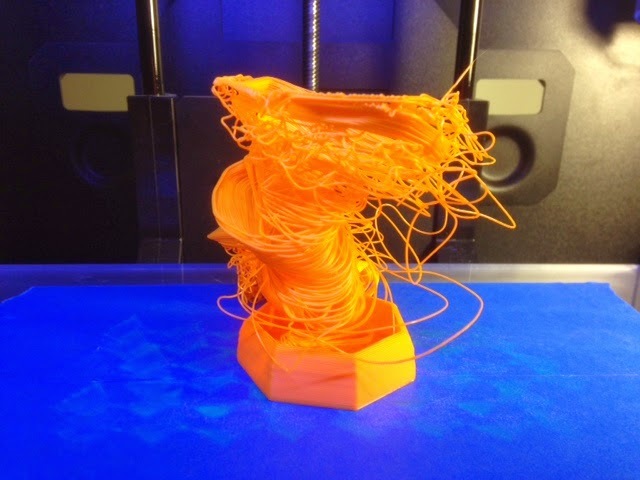 There are plenty of negative things to talk about regarding 3D printing: copying keys, printing guns, copyright violations, non-standard filament spool sizes, and yes, the fact that sometimes the learning curve is steep. And sure, 3D printing isn't yet at the point where every household needs or wants to have a 3D printer. What upsets me is that Stevenson's dismissive, snarky article perpetuates the feeling that we should all expect things to be handed to us, fully functional. That we shouldn't have to think, or learn, or be creative, or fail. The best spin I can think of for this article is that Stevenson set out to write an article about 3D printing, ran up against a deadline, and decided that if he couldn't succeed before his print deadline then the best thing to do would be to complain that 3D printers are just so impossible to deal with that no normal human could possibly find them useful. That's the best spin, because the alternative would mean that he genuinely was not willing to fail or learn after falling down just a few times, and that possibility is very sad. It would mean that he approached 3D printing as if it were just another way to consume - instead of trying to make any models himself, he only tried printing what he dismissed as "trinkets and geegaws" and then was disappointed when they didn't pop out of his 3D printer like it was a vending machine. If you want a quick and cheap source of little plastic trinkets, then go to the Dollar Store. If you want to actually learn to make something yourself then go get a 3D printer. In the Thingiverse community we may start out designing "geegaws" but we are learning the skills to make bigger and better things all the time, and to teach those that come after us. The filament-extrusion 3D printing technology that we hobbyists have on our desks is decades old, and isn't representative of what the pros can do with 3D printing (bioprinting, circuitry, airplane parts, houses, you name it). But limited as it is, we don't want to mindlessly consume our entire existence from the shelves of Target. We want to MAKE things. Being driven to make rather than just accept the status quo is what enabled projects like RoboHand's Mechanical prosthetic hands printed on a MakerBot Replicator 2 and Manu Prakesh's 50-cent paper microscope that folds like origami, both of which replace expensive and inaccessible consumer products with things that are inexpensive and easy to share. 3D printing enables doctors to do complicated facial reconstructions, builders to make new types of houses, and even helps NASA create tools for space exploration. Technical notes: I'm no artist, so to get the profile of C's face as the side of this vase required some tracing. Specifically, I sized a .jpg of C's profile to be the same as the drawing window in anoved's Customizer, and then put a piece of paper over the screen to trace the outline of his face from the .jpg. Then I put the paper over the box in the Customizer and looked through it to guide the mouse and trace out the profile. A *lot* of failure was involved here, and I had to try the Customizer sketch many times before it looked right. Then my initial try at printing a vase failed because of some massive overhang under the chin part of the profile. Trying to resketch to avoid that overhang didn't work; somehow every orientation came with some unacceptable overhang. In the end I sketched a thinner model, downloaded the solid .stl model output from anoved's Customizer, and imported it into Tinkercad, where I made a hole for a 7/8" candle and made a septagon indentation at the top. 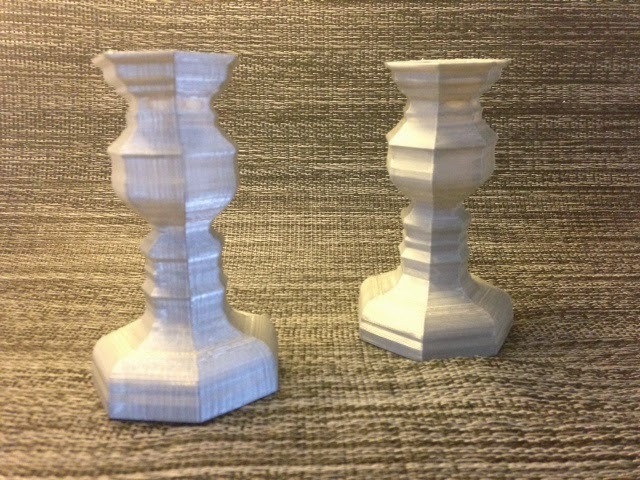 The candlesticks were printed in white and then colored in later with a silver Sharpie. They look pretty good but it's weird to pick them up because although they look a bit metallic, they each weigh only 32 grams!